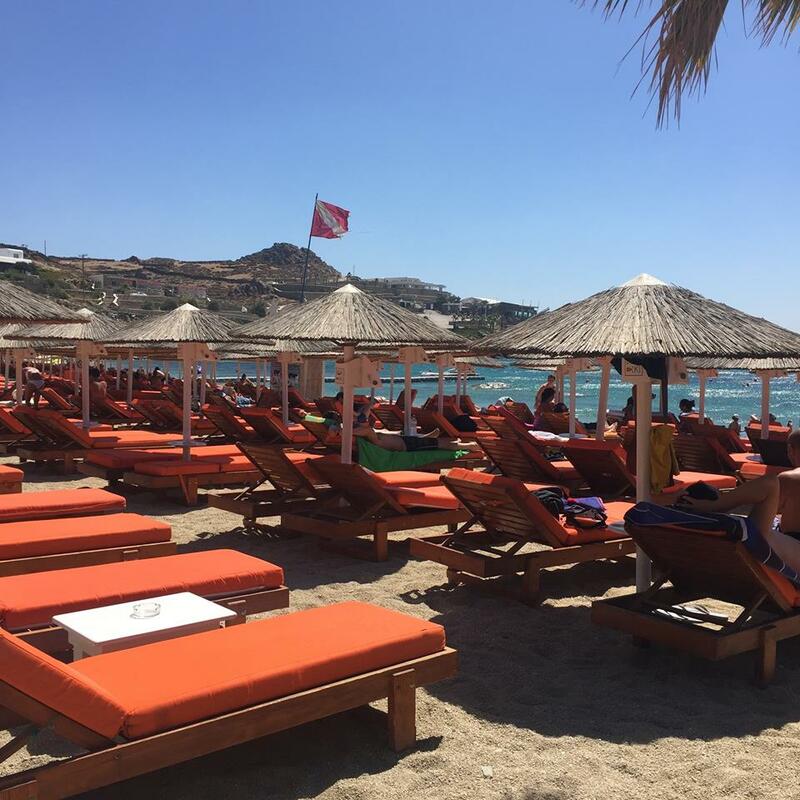 I knew after visiting Mykonos last year on a cruise that I had to return to the most beautiful island in the world to explore it more. I really am not lying when I say this, in my eyes there’s more to it to Santorini and other islands I’ve had the chance to visit, and I really can’t get enough of the narrow white washed streets, perfect weather and luscious beaches, you’ll probably have had a glimpse of what this island life was like if you follow me on Instagram. Heading to Greece in August, I couldn’t have picked a hotter month and it really was that, being on an Island it does get pretty windy though – which is a nightmare for someone with long hair like me, the only saving grace was that the wind meant you could sit out in the sun without there being a really intense heat. After discovering a lot more of the island this time, it’s only right for me to share this pretty little island with you…(be warned though that there is rather a lot of photos!). 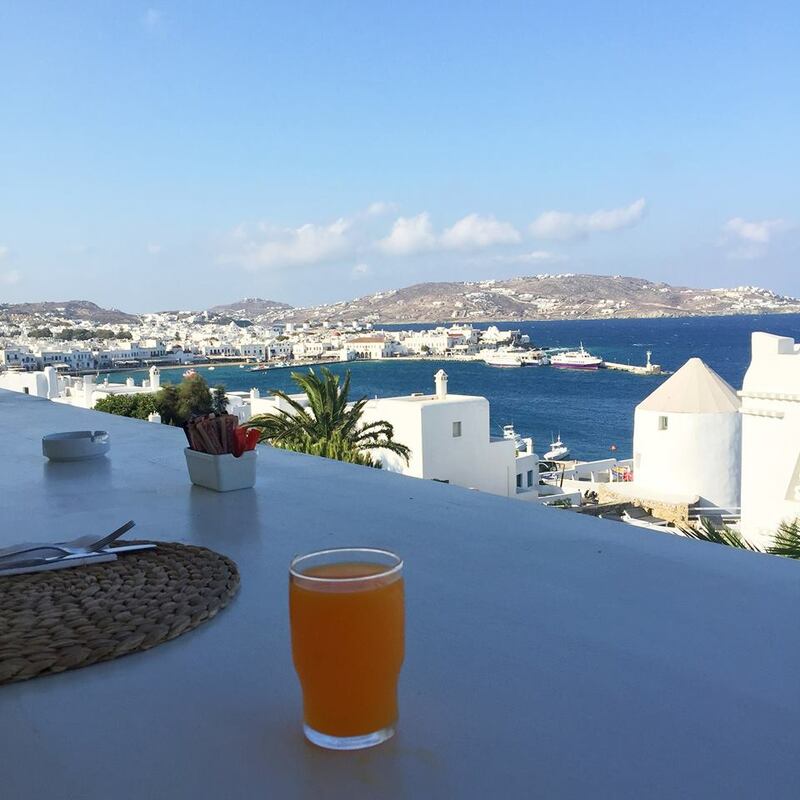 We stayed at the Porto Mykonos Hotel which was literally a one minute walk into Mykonos town, the location couldn’t have been any better, and as you can see we had the most stunning sea view. 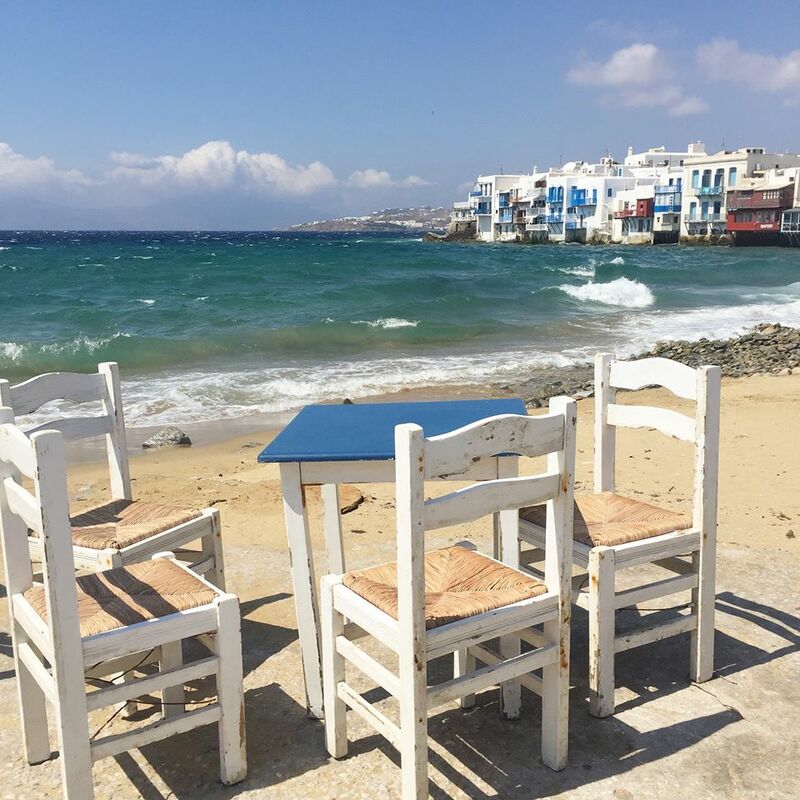 Personally for me I wouldn’t stay any further out of Mykonos town as you don’t have the choice of restaurants, cafes and availability of buses. From the port you can also get ferries across to other islands for the day such as Delos which I would have loved to have done if the weather wasn’t as hot! Our room was a typical Greek room that was clean, white and had a tiny bathroom – but don’t they all?! What sold it to me was the location of the hotel and the stunning sea view from the balcony (more about that later). We had breakfast included which was a simple buffet which had hot food, cereals and cakes, all which could be enjoyed with a sea view. The staff were excellent and I wouldn’t hesitate in going back to the same hotel. The pool and bar area was just perfect – some perfect backdrops for that perfect Instagram shot! 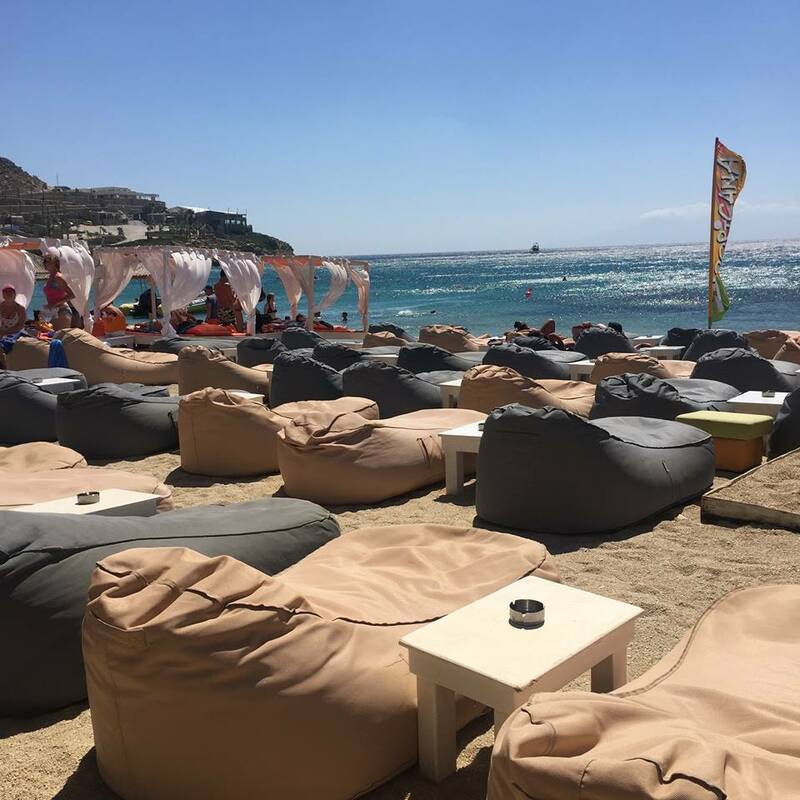 Despite not being a large amount of sunbeds we never struggled to get one during the day, they were so comfy to lie on and nothing like the uncomfortable plastic sunbeds you find in some resorts. However, as this was a boutique hotel (as most of them are in Mykonos) I think there was only around 60 rooms. Breakfast time was just amazing, clear skies, good view and delicious breakfast, what more could you possibly wish for? I got some wear out of my favourite Triangl bikini – I won’t be buying another due to the sheer price and custom charges I had to pay! Very annoying grr. 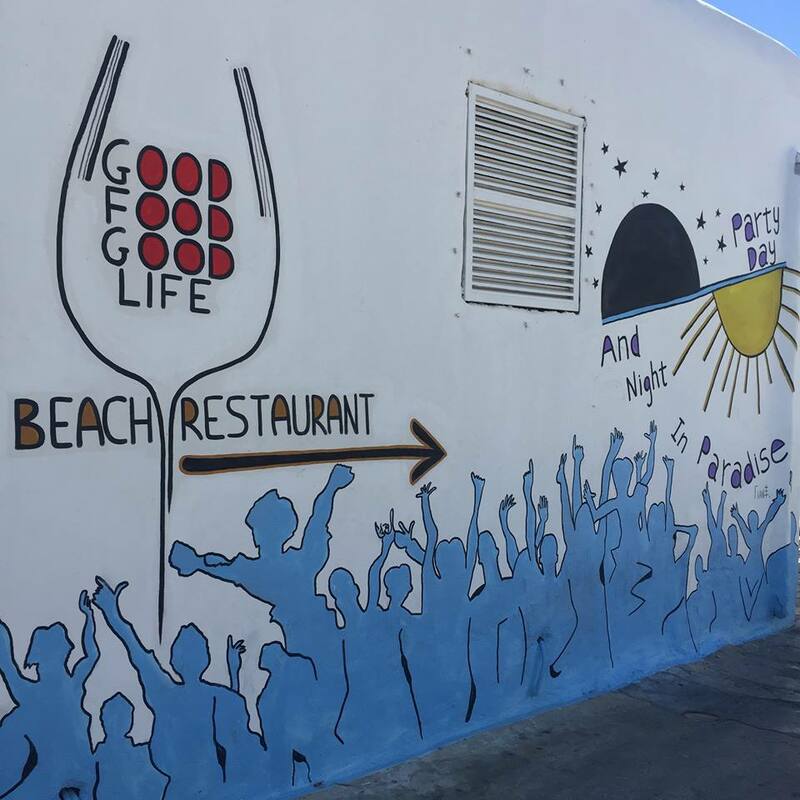 There was such an abundance of restaurants in Mykonos town, we loved the ones directly next to the sea, with the gentle lapping of the waves and a view of the sunset it really was heaven. The food was even better, there’s none of your typical English pub type restaurants here, it’s mostly Greek and Italian cuisine. The sea lined restaurants lit up at night were breathtaking against the pink skies. 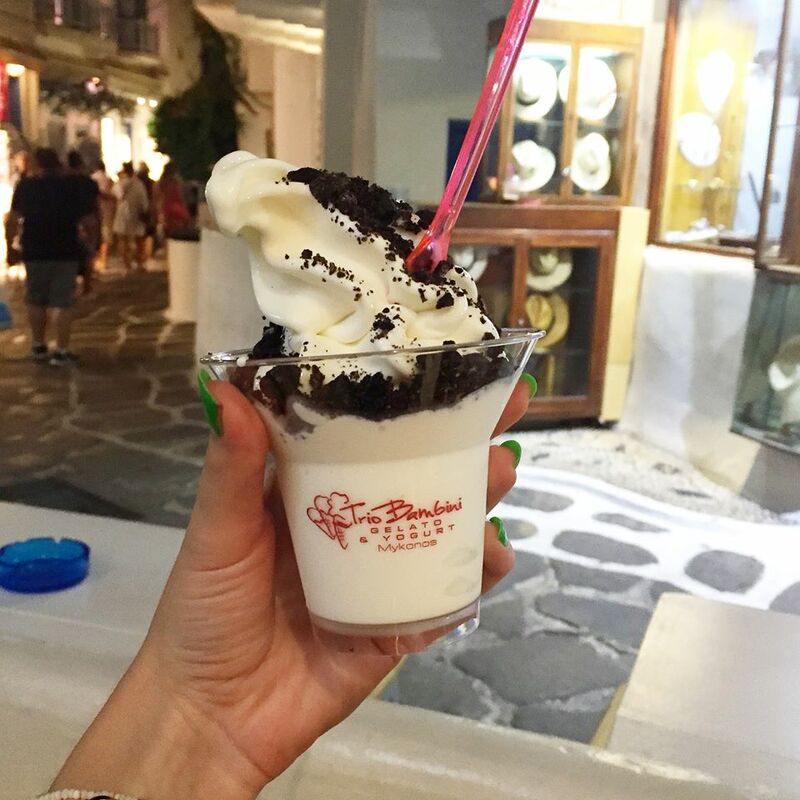 There was always room for a Greek yoghurt frozen ice cream, sooo delicious! Trio Bambini was one of my favourite places, they also had great wifi haha! Posing in my Topshop dress in the back streets of Mykonos town. There was motivation around every corner, I remember seeing this last year and being able to relate how true this statement was, there really is no elevator to success! The Island really was super windy! The views on our balcony were spectacular, there’s few places you can stay that all offer a great sea view and location- I was in heaven. 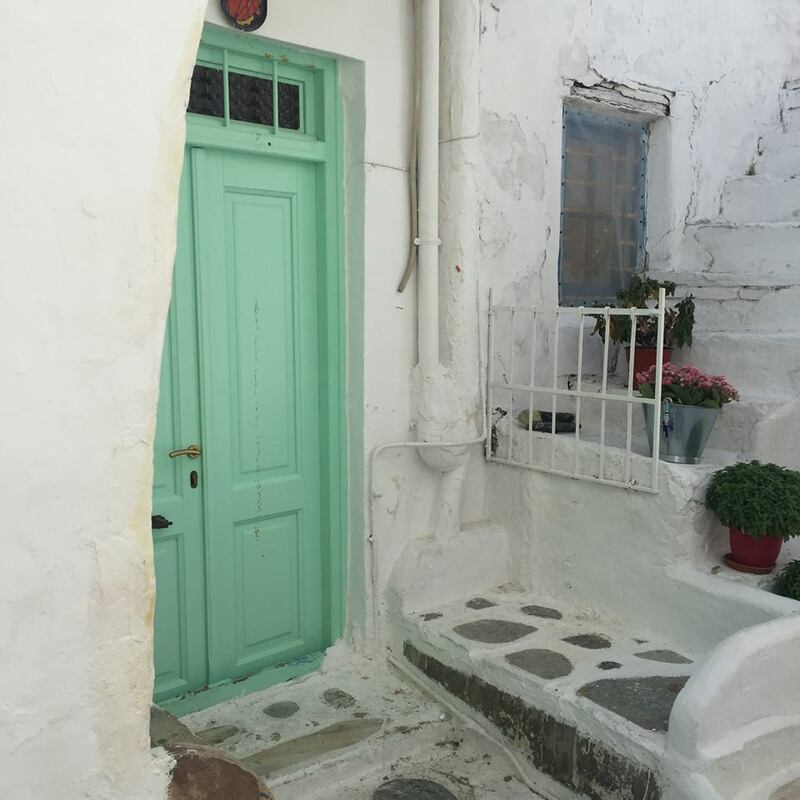 Every street is pinterest worthy and beautiful. 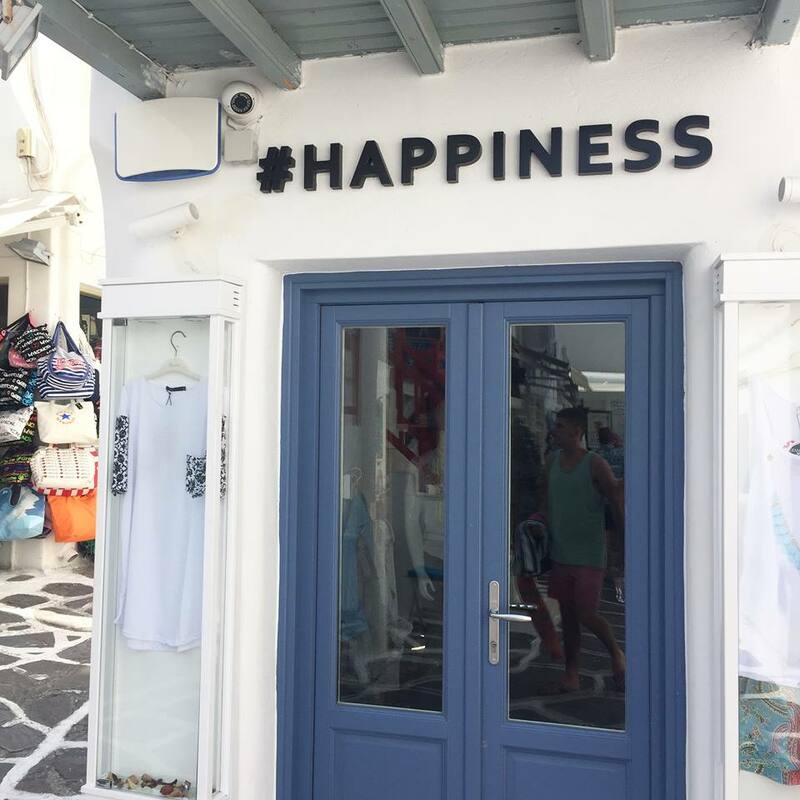 It was very easy to get lost within the winding streets of Mykonos town, I’m sure we seemed to find a different row of shops every night! Once you’re in it’s hard to get back out again! Possibly the prettiest restaurant in existence, draping hot pink flowers and light globes hanging from the ceiling, this place looked stunning lit up at night. These hot pink flowers were everywhere! The sunsets just kept getting better! 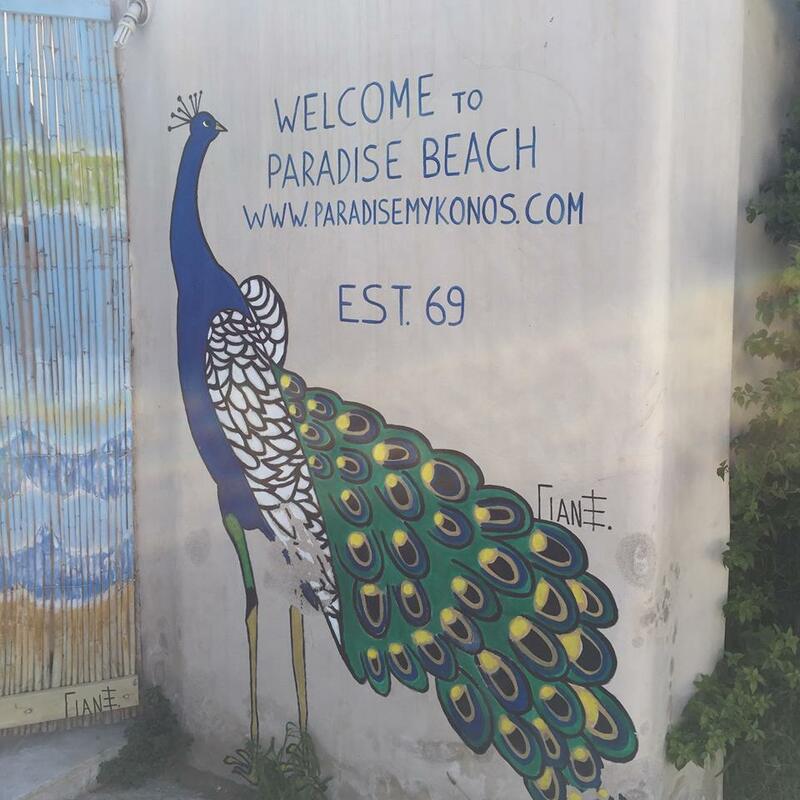 There were many surrounding beaches to Mykonos town that just required a short bus trip, the bus station was just below our hotel and after hearing so much about the local beaches, we decided on Paradise beach, for only 2.40 euros for a single ride it was silly not to! 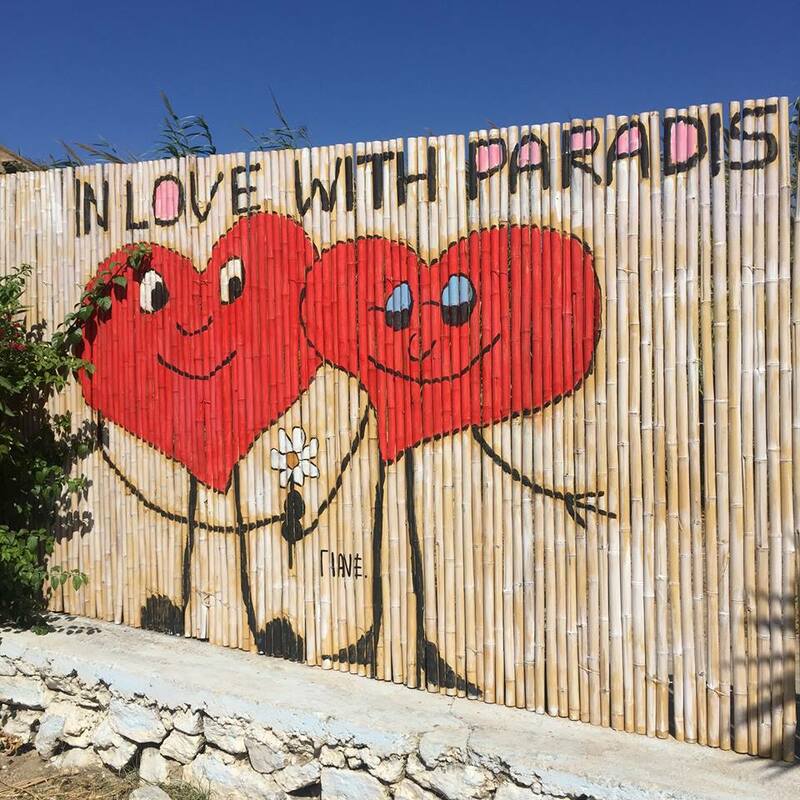 When you arrive at Paradise Beach you’re led down a winding lane filled with quirky artwork, it gives the beach a really cool vibe before you even hit the sand. Ice cold chocolate milk was needed to cool off! It was time to head back on the last bus of the evening being left with this little reminder. This had to be one of my favourite oufits of the holiday! The Princess skirt is from Sisterjane, the top is from Bank and the sandals are from Matalan! 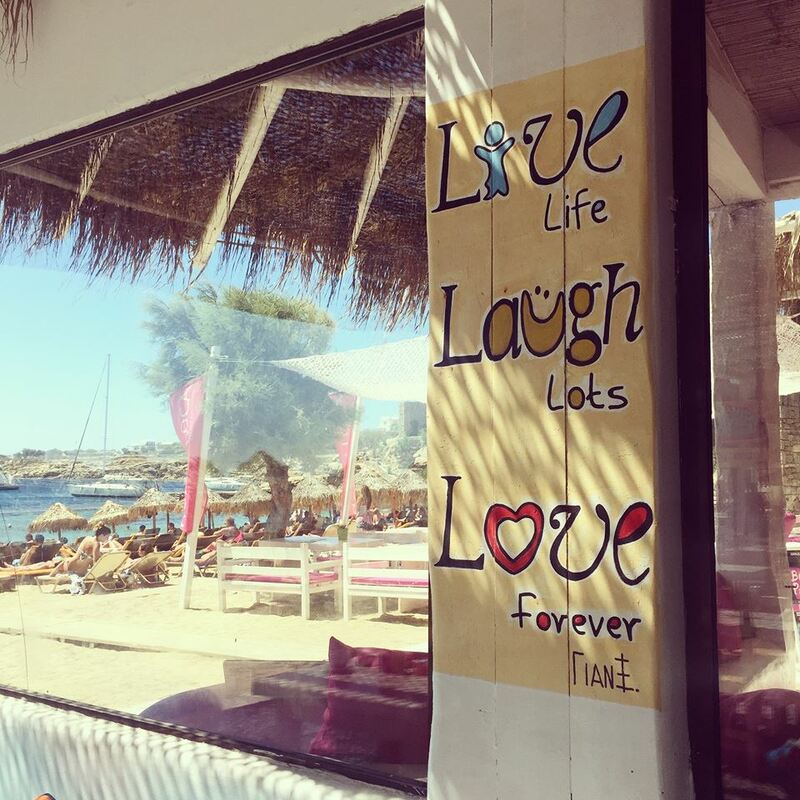 We admired the luxurious yachts, Mark Vandelli was in Mykonos last week too but we sadly didnt spot him, I somehow don’t think walking down narrow streets with other people is his thing. I loved waking up to see different cruise ships everyday – and secretly wished i was onboard! The white washed streets were perfect for outfit photos! It was time for one last look around the streets. There were quite a few bakeries in Mykonos town that were literally piled high with stuff, it’s crazy to think that they can sell all of this stuff! We picked up some mini chocolate doughnuts – which were very good by the way! 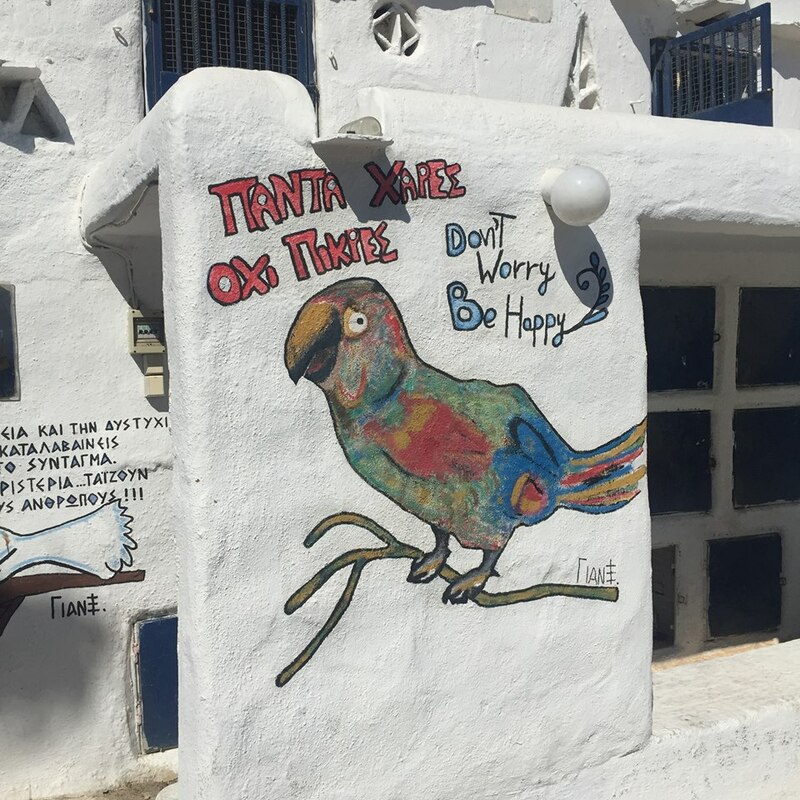 The windmills are a popular tourist attraction in Mykonos, you can see why the island is littered with these when the wind is so strong every day. 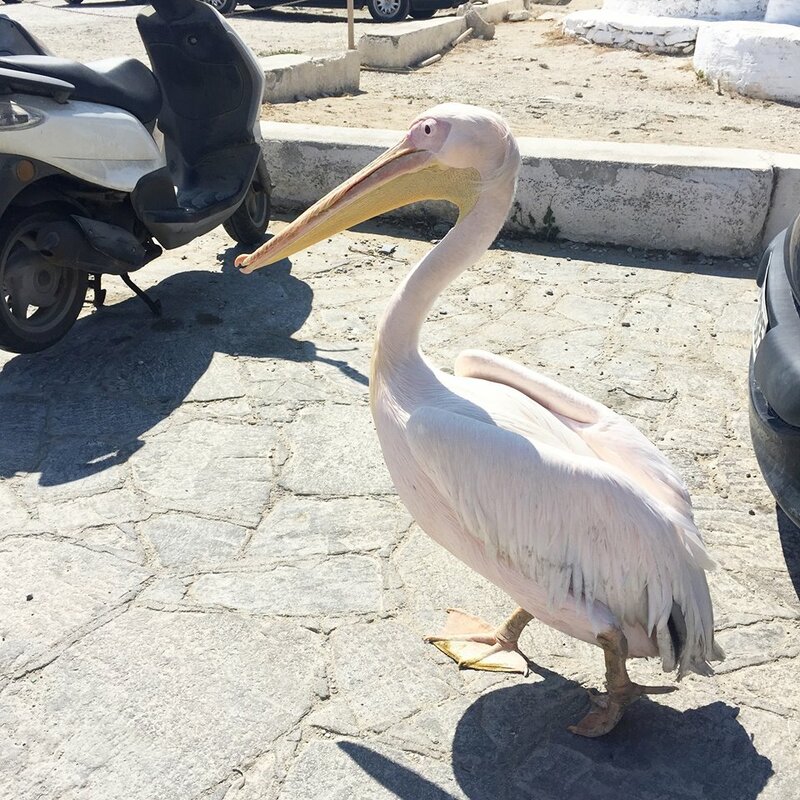 The resident pelican Petros, it seems he’s the only pelican on the island and is in fact an ambassador of the island. I felt privileged to spot him as we didn’t get to see him again, he must be very old and if you look closely he has the cutest white tufts of hair! 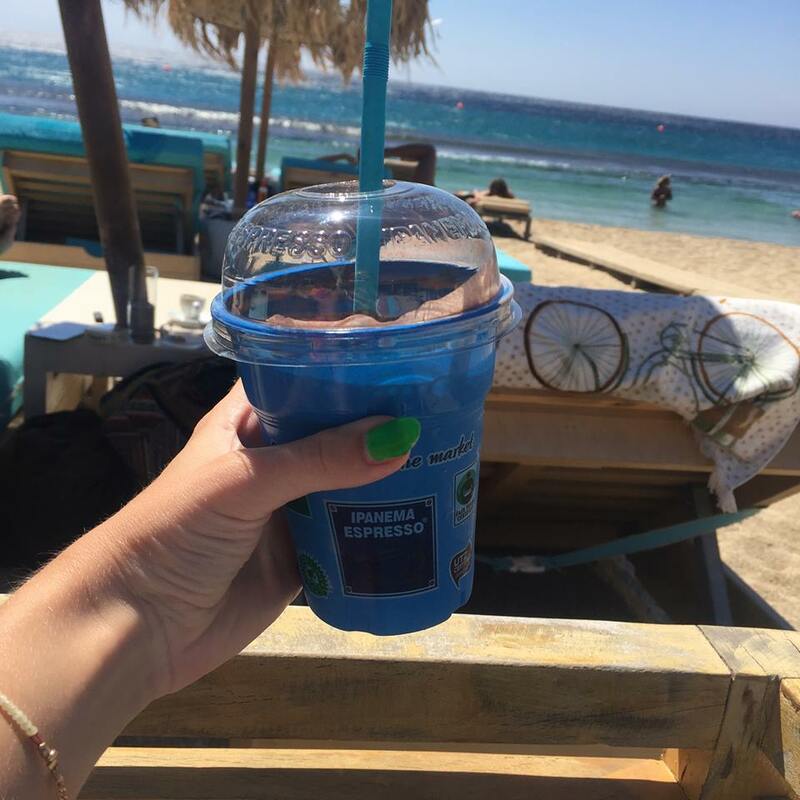 Mykonos is actually one of the top party islands in the world, according to google, so it must be right?! There really was a lot of activity on the island in Mykonos town and further out towards some of the beaches. Skandinavian bar was a notorious bar/club that was packed with locals and tourists every night! I don’t think there’s anything cooler than dancing under the light of the stars! 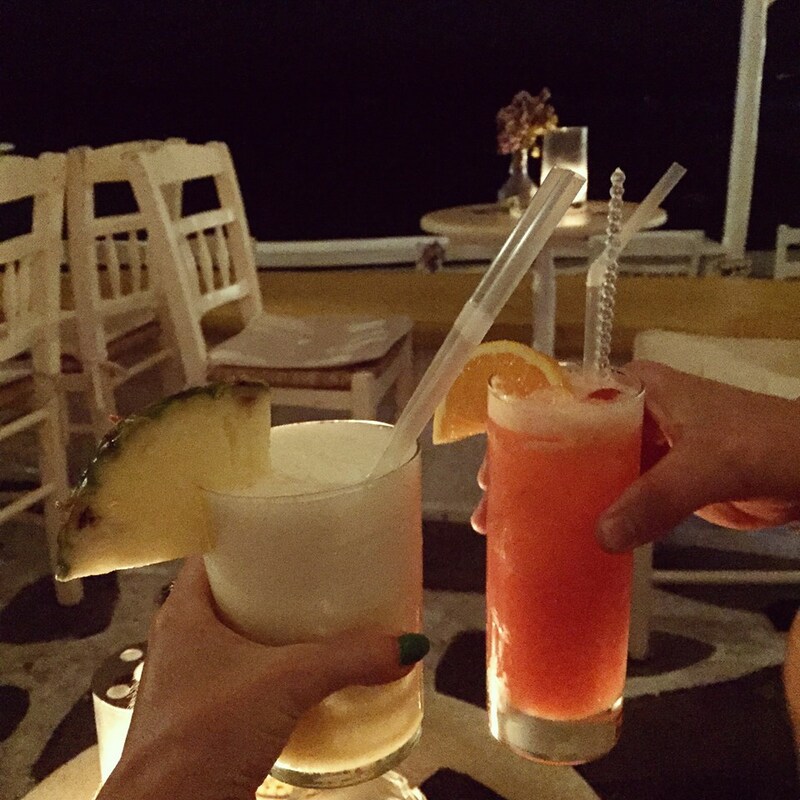 But drinking a fresh pineapple juice and listening to the waves lapping the sides of the bar in Little Venice in the evening was more my type of thing. I didn’t want to say goodbye.. 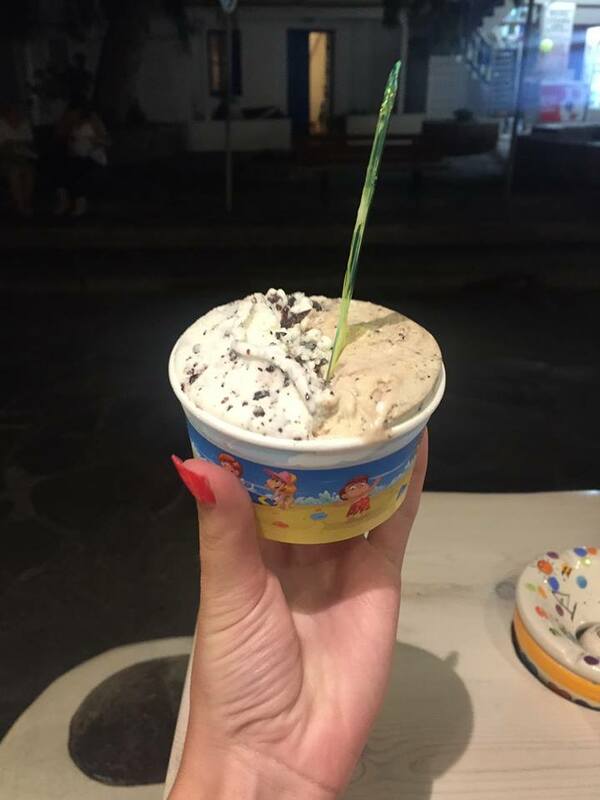 There was time for one last ice cream – cookies & stracciatella! 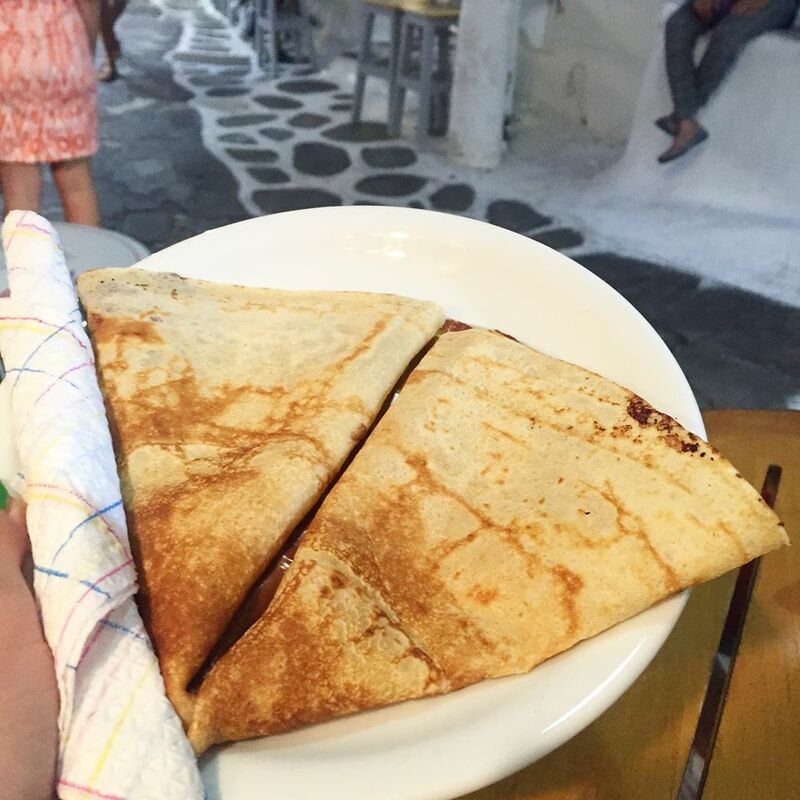 Did I mention that there were creperies everywhere! 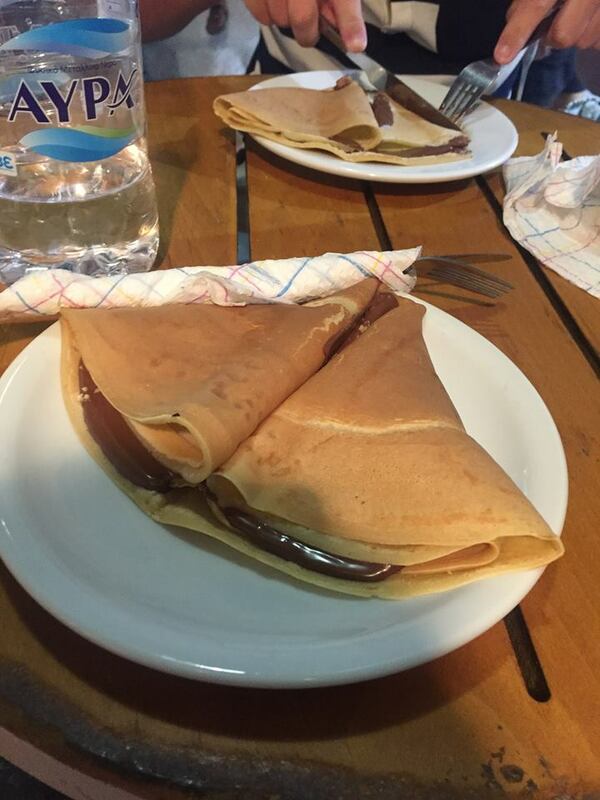 The nutella crepes were out of this world! It was much cheaper to have a dessert in these little places too, being an island meals and food were generally more expensive. There was also time for one last sunset before we had to say bye to the beautiful island! I hope you’re all having a lovely weekend! 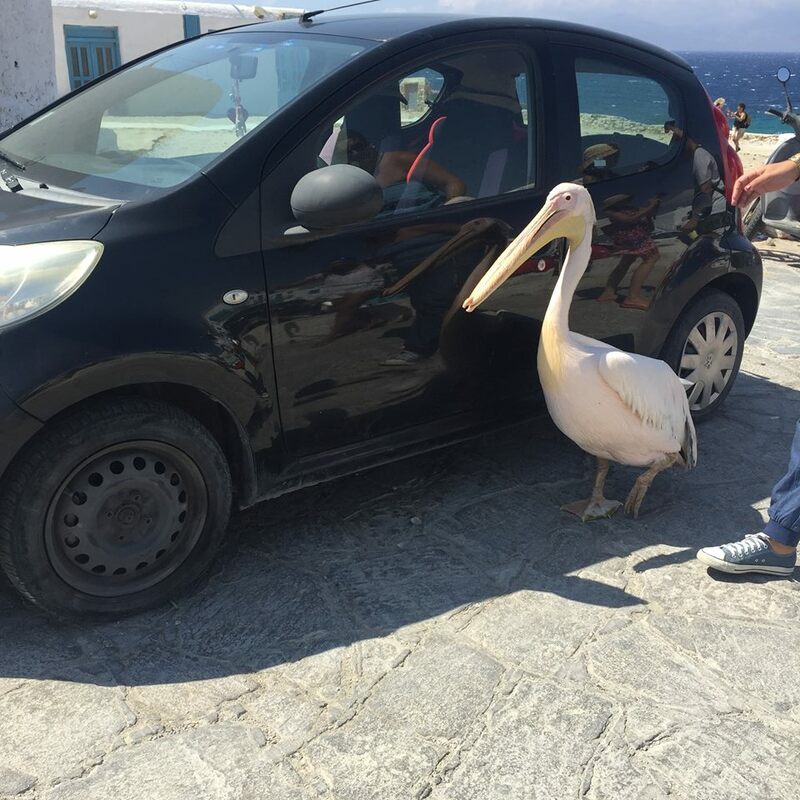 Would you like to visit Mykonos? What’s the best place you’ve ever visited?